Here you’ll find info on the health benefits of sprouts, simple sprouting directions and one of my favorite sprouted lentil salads! Sprouts are incredibly simple and fast to grow. – to maturity in 3-5 days! – A potent source of antioxidants and alkalizing to the body. Both of these effects are essential for protecting against disease and strengthening the immune system. – A good source of essential fatty acids, which many diets are lacking in. – An excellent source of fiber. – Filled with an array of essential minerals. (During sprouting, the minerals develop into a chelated form, making them easier for the body to utilize). Sprouts are low in calories and low on the glycemic index, making the high return for your investment worth the initial time and money spent. Only a few dollars and a few easy days will provide you with a number of fresh, nutrient-rich meals or snacks. So start the New Year right and sprout some delicious seeds, legumes and grains today! *From the USDA Nutritional Database. Alfalfa – 1 1/2 Tbsp. Clover – 1 1/2 Tbsp. Radish – 1 1/2 Tbsp. Fenugreek – 1 1/2 Tbsp. Inspect seeds and remove any that are broken. Place them in a jar, rinse and drain. Fill with spring or filtered water, about 2–3 inches above seeds or legumes. Soak overnight, approximately eight hours. After eight hours, drain water. Rinse soaked seeds. Place jars, with the screen/cheese cloth securely fashioned on top, on a rack or in a bowl (mouth down) at a 45 degree angle so it can continue to drain and allow air to circulate. Make sure the seeds are not totally covering the mouth of the jar as this will block the air flow and cause the seeds to spoil. Cover with a towel to keep dark for the first couple of days. This will ensure germination. Rinse and drain 2–3 times a day. Legumes and grains do not need sunlight and will be ready in 1–2 days when the sprout tail is 1/8 inch long. For unhulled seeds, such as alfalfa, clover and radish, continue rinsing and draining for 2–3 more days and place in indirect sunlight until the leaves are deep green. To harvest grains and legumes, just rinse and serve. For unhulled seeds and some legumes (such as mung beans), place in a container and submerge the sprouts until the hulls rise to the surface. Skim them off and place sprouts back in the jar to drain. 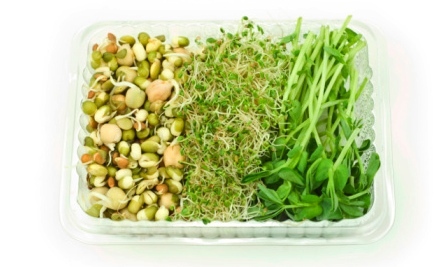 Refrigerate all sprouts after they are fully sprouted to maintain freshness. They will last 5–7 days when refrigerated. Once wheat berries are sprouted, they can be used to make uncooked Essene breads and other healthy treats. 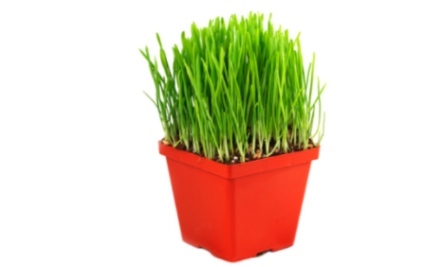 Fill with spring or filtered water, about 2–3 inches above seeds. Soak for 12 hours. Rinse and drain 2–3 times a day for 1–2 days until the sprout shoot is growing. A good mix is 75% topsoil & 25% peat moss or 50% top soil, 25% peat moss and 25% compost. A prepared vegan-organic potting soil can also be used. A small amount of fresh sand, rock dust, kelp/seaweed or other veganic fertilizer adds to the potency of the sprouts. Mix soil in a bucket or box, and fill trays at least one inch thick with soil. Sow seeds onto soil and spread out. Seeds should touch, but not be bunched on top of each other. Water them daily and cover with shade cloth or towel. After three days, uncover and put in indirect sunlight. More sun = larger leaves. Harvest 5–8 days from planting when sprout is just over 2 inches tall with deep green leaves. Harvest with a serrated knife or scissors, trying not to pull plants up by the roots. Remove hulls with fingers. Brushing the tops of the sprouts with your hands before harvesting helps to remove the hulls. Mold may grow if the seeds are too damp, planted too closely or have poor ventilation. Use a shade cloth to cover instead of towels or newspaper and water less. A sparse crop can happen if the seeds were soaked too long or not watered properly. Pale sprouts may be caused by insufficient sunlight. I love this salad from Incredibly Delicious: Recipes for a New Paradigm. It’s hearty, but not heavy, and is great on its own or in a wrap! the vegetables and mix. Chill and serve. Incredibly Delicious: Recipes for a New Paradigm contains an extensive chapter on raw food preparation as well as many more tips to make the transition to veganism easy and delicious!